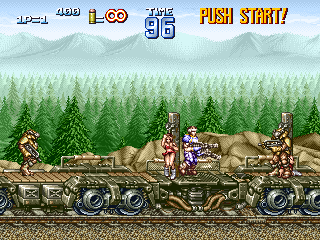 In this precursor to the Metal Slug series, you and a friend play as commandos Max and Lei, saving the world from an army of fearsome alien invaders. 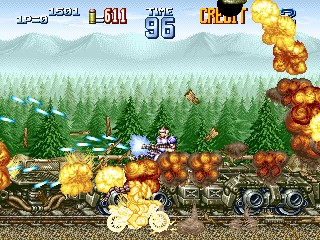 Using the joystick to aim your twin machine guns, you can gun down everything that comes your way as you travel through each level and defeat the boss at the end. Special weapons change one of your guns into another weapon, and you can make it stronger with a Power item, or grab an SP Boost to use a super-strong version of the weapon for a limited time. Vehicles can be found at numerous points in the game, just waiting for you to hop in and mow down the next wave of enemies with their included weapons. Many kinds of robot walkers and tanks are yours for the taking, as well as hovercrafts and flying mecha suits. Prisoners are all over the levels, and rescuing as many of them as possible will pay off in the end. For picking up medals, saving prisoners and defeating the end-of-level bosses, you receive rank points. As you get promoted to higher ranks, you get a multiplier to your bonus points at the end of each level. Now you can add videos, screenshots, or other images (cover scans, disc scans, etc.) 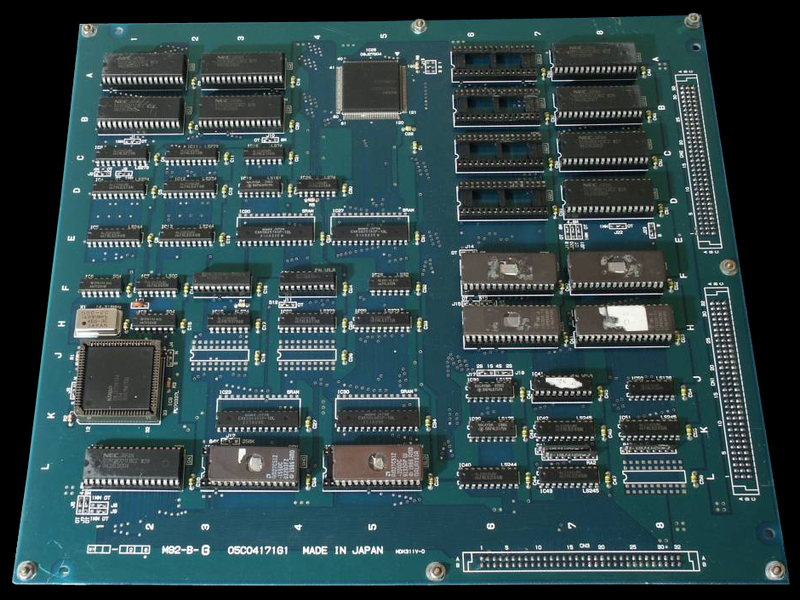 for Gun Force II (US) to Emuparadise. Do it now! If you haven't noticed yet, we have a retro game of the day feature (top-right of the screen) wherein we feature a new retro title every single day! Now, you can vote for your favorite games and allow them to have their moment of glory. 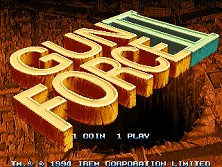 Click on the button below to nominate Gun Force II (US) for Retro Game of the Day.